For as long as I can remember, every year as a kid I looked forward to watching “It’s The Great Pumpkin Charlie Brown” on TV. It was just one of those holiday shows that was a tradition in our household and was a staple every Halloween. As our children have grown, we have continued this tradition but maybe less formally than in the past. No longer are we tied to a specific time and date to see this Charlie Brown classic, instead we now have the luxury of instant gratification by owning the blu-ray. The story is still timeless and spans just about any generation young or old alike. All of your favorite peanuts characters are present and I must say that this and “A Charlie Brown Christmas” are my favorite Charlie Brown stories. 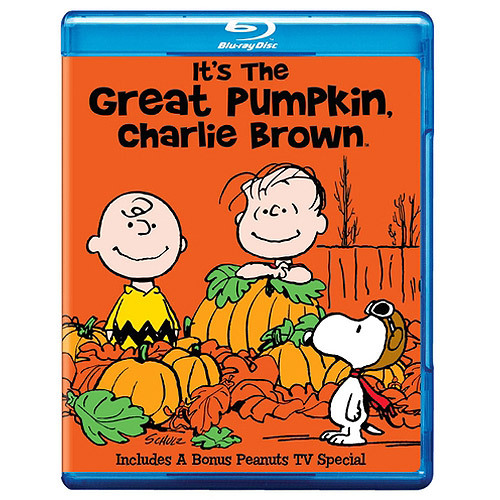 To celebrate Halloween, we are giving away 1ea Blu-ray/dvd combo pack of “It’s The Great Pumpkin Charlie Brown” to one of our lucky readers. Enter the giveaway below for your chance to win. Roasting pumpkin seeds and pumpkin patch fun! We dress in costumes for the trick or treaters. Not much tradition for Halloween. Just take kiddos out trick or treating. My girlfriend and I always watch Nightmare before Christmas. I watch this show and give out goodies. We order pizza, turn off all of the lights and watch scary movies – they get scarier as the kids get older. Watching the Great Pumpkin is my tradition! We haven’t really started any traditions, tho we’re going to take our little ones to a pumpkin patch this year. Maybe that’ll become tradition. We just give out candy to the kids. Our Halloween tradition is that we always play our halloween music, carve the pumpkins and then roast the pumpkin seeds. Our traditions are more fall based- picking pumpkins, playing in the leaves, etc. We make roasted pumpkin seeds from the pumpkins we carve every year! Carving pumpkins and roasting the pumpkin seeds! We usually have some church activity on or near Halloween that we attend. My children are expected to create costumes. We don’t really do store bought costumes unless they put it on their Christmas list since costumes go on clearance November 1. We always visit the local pumpkin patch, buy a pumpkin, bring it home, carve it, and roast the seeds. We always carve a pumpkin the day before Halloween and then we take our daughter trick-or-treating on Halloween. We like to go trick or treating and carve a pumpkin. Also we go to the event at our church. We love to decorate the house/yard. We make the kids trick or treat at our house first and then we go out with them and do the neighborhood…..super silly tradition but we’ve just always done it. We don’t really have any, just take my daughter out trick or treating. We always go as a family to the local pumpkin patch to pick out our pumpkins. Taking all the kids out together. We carve pumpkins, and I roast the seeds. Then we order pizza and watch a movie. I pass out candy about every three years, because that is about how many times the weather is nice enough for kids to go out. Roasting pumpkin seeds is our tradition every year…. We like to toast the seeds from our pumpkins. We always carve pumpkins and go trick or treating. We carve pumpkins and eat the seeds with some apple cider! We decorate the house and carve a pumpkin every year and make halloween cookies & cupcakes. Our dog has a glow-in-the-dark skeleton costume. This is the best during the holidays of either Halloween or Thanksgiving, it’s like a tradition to watch the classics.